Today, H.E. Ambassador Khojesta Fana Ebrahimkhel presented her Letters of Credence to H.E. Dr. Alexander Van der Bellen, Federal President of the Republic of Austria. 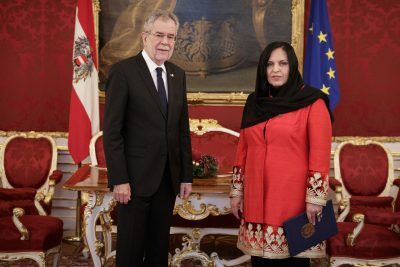 This marks the starting point of her tenure as Ambassador Extraordinary and Plenipotentiary of Afghanistan to Austria. Madam Ambassador thanked the Federal President for the warm welcome and pledged her full cooperation. The excellent diplomatic relations between the two countries were established during the 1950s and were continuously strengthened. For instance, an Austrian music school was founded in Kabul. Over the past fifteen years, Austria has provided essential development assistance to Afghanistan, and has contributed to the UN/NATO ISAF and RSM missions. The Ambassador expressed her gratitude to the Austrian people for their continued support to Afghanistan. 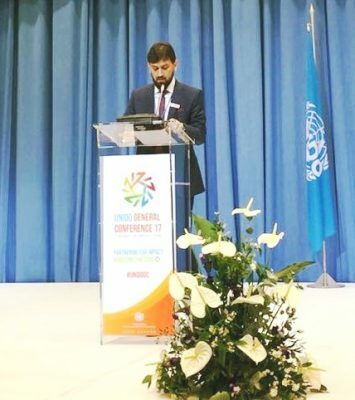 The Embassy serves and protects the interests of the Afghan community in Austria and works to further enhancing the bilateral relations with the friendly country of Austria, in politics, trade, culture and education.